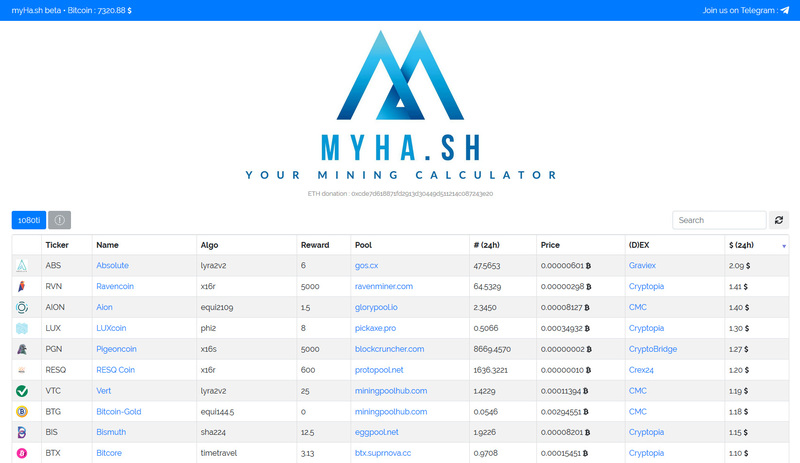 myHash is yet another interesting, useful and very simple mining calculator that gives you access to an easy way to see what is most profitable to mine at the moment for a single Nidia GPU (AMD not currently supported). You get brief information about the supported coins including hashrate and miner used, pool and exchange where it is being traded and of course the 24 hour profitability. Could be another handy tool to quickly check out for new interesting coins with nice profitability, so you could add the myHash mining calculator in your arsenal of crypto tools. There are of course some things that can be further improved regarding the profitability data, so it is not only for the last day, but for different time frames as often things change much more rapidly in the world of crypto. With the current low prices of altcoins and low mining profit in general it is always a good idea to check for potential new coins – either new releases or ones that have higher profit at the moment. So a new profitability mining calculator is always handy to have, especially if it offers more algorithms and supports more coins that other more established and well know such services. ShitToMine is a new such service that offers a more extensive mining calculator, covering more mining algorithms, including even some CPU ones as well as with more coins – over 300 being tracked at the moment. There are presets for automatically setting hashrate and power usage for the latest generation of Nvidia GPUs, though unfortunately not available for all of the supported algorithms, so you will still need to fill in some values manually. Unfortunately no option for CPU algorithms or AMD GPUs at the moment to help you with hashrate and power in order to calculate profitability easier, you have to do it manually. Do note that there is also a section for ASIC miners with algorithms for the ones available where you also need to manually fill in hashrate and performance. There is apparently more work needed to be done, it is still beta version, but it looks promising and can be useful, so we do recommend that you give it a try and see if you may find something useful as information and that goes not only for the mining calculator. 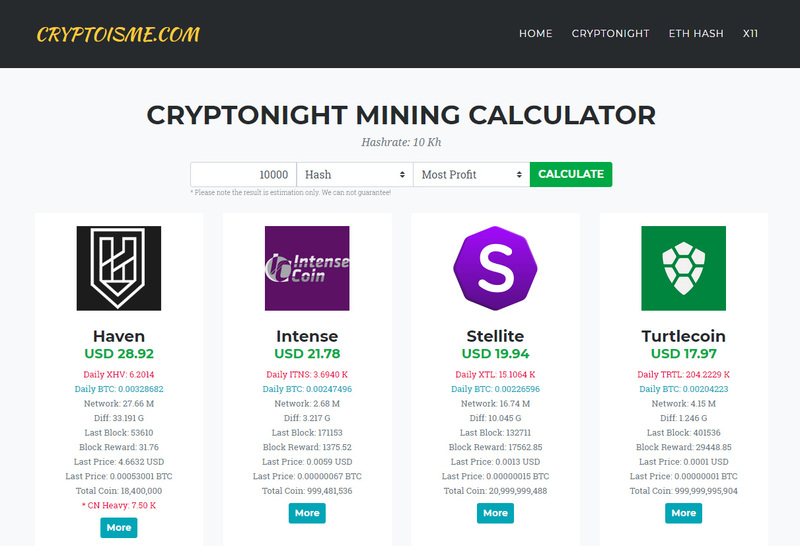 Cryptoisme is a free service offering quick and easy to use mining calculators for multiple algorithms – CryptoNight, Ethash and X11, but we are mostly interested in the CryptoNight part that is probably also most interesting for you. 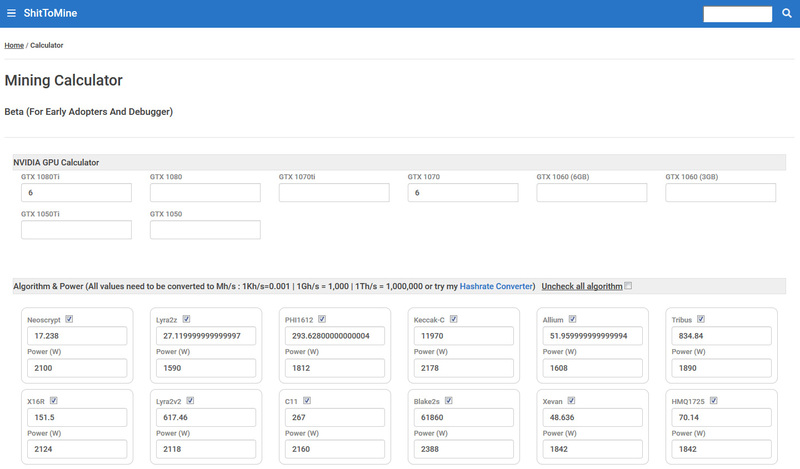 The calculator tracks multiple crypto coins and ranks them by profitability based on your hashrate alone. Do note that for CryptoNight you only give the regular CryptoNight hashrate you are getting, but there are some coins like Haven (HVN) that use CryptoNight Heavy algorithm where the hashrate may be different (it is calculated based on your base CryptoNight hashrate). Haven (HVN) by the was seems to be the most profitable in the last days and it has been getting more attention lately, so you might want to check it out if you still haven’t done so. Anyway, Cryptoisme seems like a good place to check along other crypto mining calculators in terms of looking for the best profitability and maybe some new coins that are not yet present in more established services that track mining profitability.